On Tuesday, Snoop Dogg announced his latest collaboration – a partnership with 7-Eleven as part of their celebrity “Cup with a Cause” program. All proceeds from his cup are benefitting his Snoop Youth Football League. 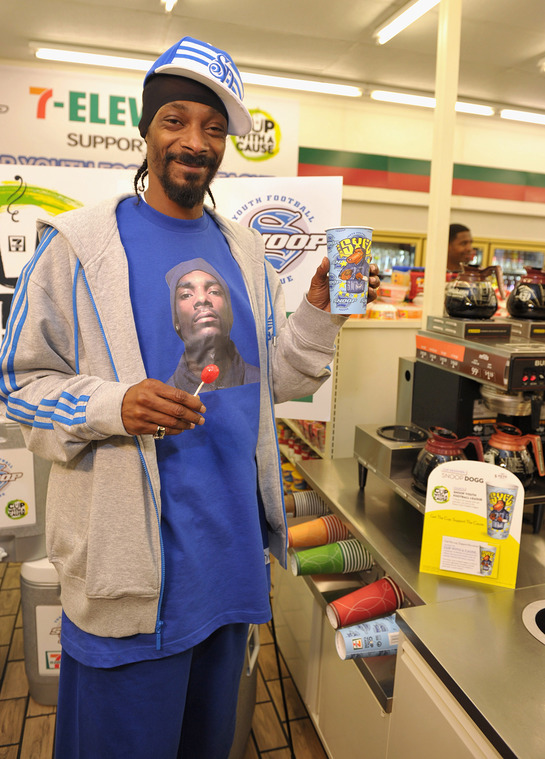 Snoop dropped by a local 7-Eleven in Hollywood to check out his cup for the first time. 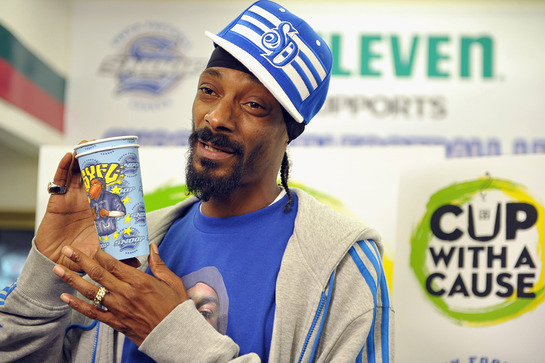 Snoop jumped at the chance to design his own cup for 7-Eleven as he’s a big fan of the convenience stores and loves that 7-Eleven’s Cup With A Cause is giving consumers the opportunity to help give back and support his charity. Later in the day, Snoop debuted the cup and some of the equipment that will be coming from the proceeds to some of the teams and cheerleaders of the Snoop Youth Football League during their practice out in Pomona. During 2010, 7-Eleven, Inc. has partnered with entertainment and sports celebrities to design limited-edition 20-oz coffee cups to be sold in 7-Eleven stores nationwide. Proceeds from the cups sold will benefit the featured celebrity’s charity of choice. While 7-Eleven is providing a guaranteed $250,000 minimum donation to each charity, donations could increase depending on the number of cups sold. Consumers can drive donations through the purchase of cups. Nicole Richie, Joel Madden and Benji Madden kicked off the program, with Jennifer Hudson and John Cena all following suit. Snoop is a huge football fan and acted as a coach for his son’s football team. In 2004, he founded The Snoop Youth Football League (SYFL) where he continues to coach. The SYFL serves children between the ages of five and thirteen, teaching them the values of teamwork, good sportsmanship, discipline and self respect, while also stressing the importance of academics. The Snoop Dogg/SYFL custom cups are available, while supplies last, at 7-Eleven stores across the U.S. from September 1st through October 18th. For more information about the program, as well as current and upcoming charities and celebrities, visit www.cupwithacause.com, www.facebook.com/7Eleven and www.twitter.com/7Eleven.